Every card featured in Rivals is neutral, including the characters. Few exemplify this conflict between the light and the dark like Anakin Skywalker, Conflicted Apprentice (Rivals, 1). Able to team up with either Heroes or Villains, he gains a unique ability based on which side he supports. This flexibility makes him a very versatile character, and his low-point cost allows him to team up with many different characters (with the exception of Darth Vader). 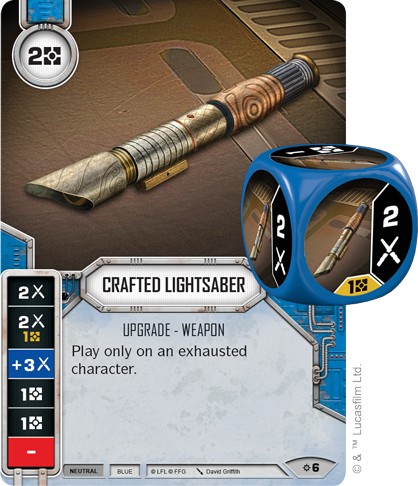 Blue also gets a new weapon in the form of the Crafted Lightsaber (Rivals, 6). With melee damage and resource sides, the Crafted Lightsaber is a focused weapon that can directly further your game plan with its undeniable consistency. The fact that it can only be played on an exhausted character means you won’t be able to use it the first turn you play it, but the investment is sure to pay large dividends in later turns. 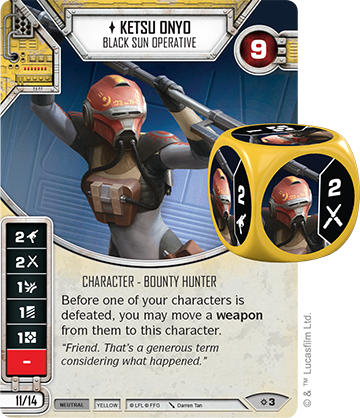 The Black Sun Operative Ketsu Onyo (Rivals, 3) is a dangerous and resourceful Mandalorian. 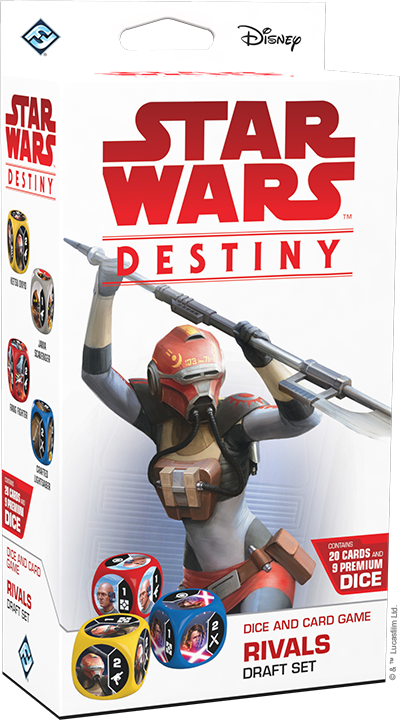 A former ally of Sabine Wren, Onyo knows what it takes to survive. That’s why in Star Wars: Destiny, Ketsu is able to collect the weapons of your defeated allies. With mixed forms of damage, Ketsu can synergize well with any weapon, and with a low point cost, she can fit into a wide variety of teams. For twenty-eight points, you may team Ketsu with General Grievous, collecting weapons with Grievous before moving them to Ketsu Onyo when he is defeated. If you want to go down the Hero route, teaming Ketsu with Sabine Wren can help you transfer Sabine’s thermal weapons to Ketsu once she is defeated, letting you get even more value out of them. In fact, you may turn to one of the weapons found in Rivals itself. 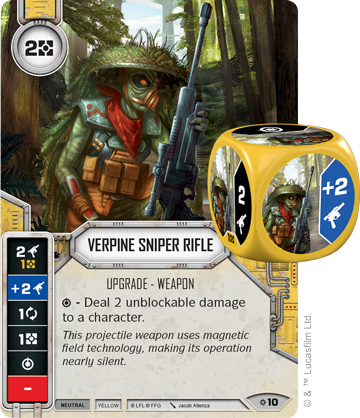 This is the Verpine Sniper Rifle (Rivals, 10). Incredibly accurate and piercing, the Sniper’s special symbol lets you do two unblockable damage to a character, bypassing shields and hitting your opponents’ characters where they really hurt. Cyborg Aide Lobot (Rivals, 2) assisted Lando Calrissian during his time as an administrator on Cloud City. 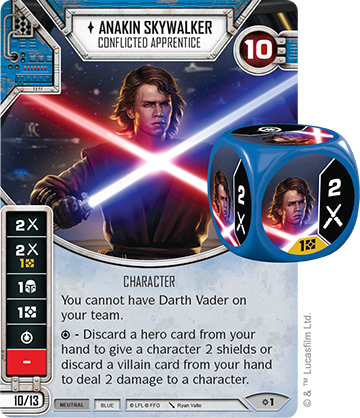 In Star Wars: Destiny, he looks to provide this same support to the other members of his team, whether they are Heroes or Villains. 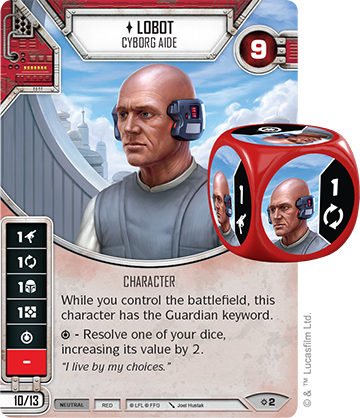 While you control the battlefield, Lobot gains the Guardian keyword, allowing him to defend whatever powerful character he is teamed up with. Furthermore, his special symbol can increase the value of one of their dice by two. By teaming Lobot with a character like Palpatine (Legacies, 4), you can protect the Sith Lord while greatly increasing his threat. Red characters also get a supportive event in the Rivals Draft Set that takes the form of a Targeting Computer (Rivals, 7). 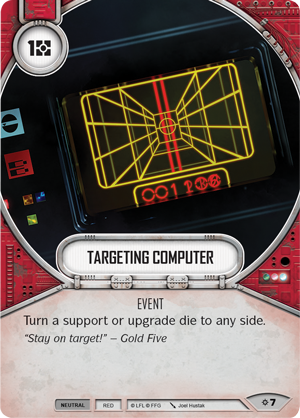 With the ability to turn a support or upgrade die to any side, Targeting Computer can give your team the consistency they need to put out big damage. 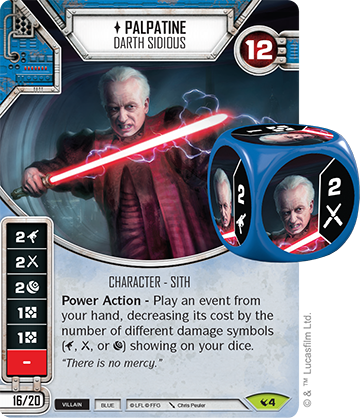 However, the card can also be used to sabotage rolls by your opponent, turning their support and upgrade dice to blanks and making them a non-factor. Whatever you choose to use the Targeting Computer for, it is sure to put you in an advantageous situation. Whether you are looking to participate in draft or want a way to expand your constructed collection, the Rivals Draft Set gives you the tools you need to succeed. Will you use these tools to follow the path of a hero or fall to villainy? 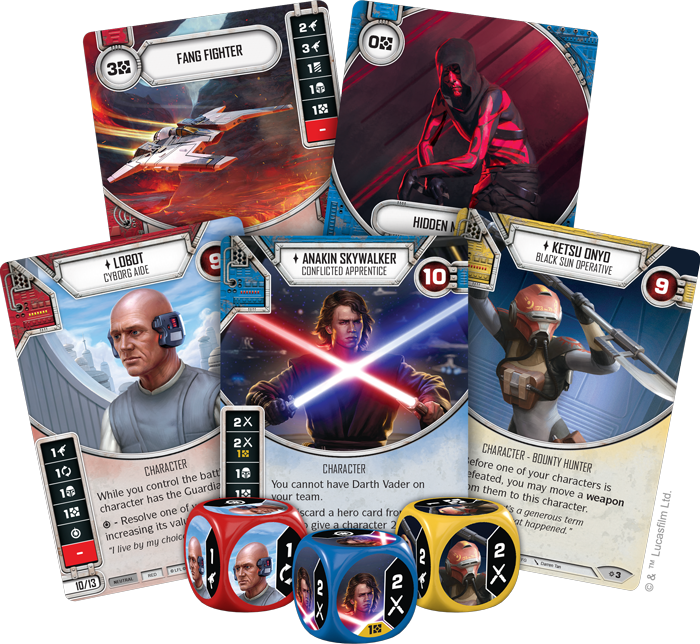 Choose your path and pick up Star Wars: Destiny Rivals (SWD06) from your local retailer or our website, today!